Razec from Esato’s back, bringing a hot new concept to life, the Sony Ericsson P905, inspired by the JavaOne handsets you’ve seen a while back. 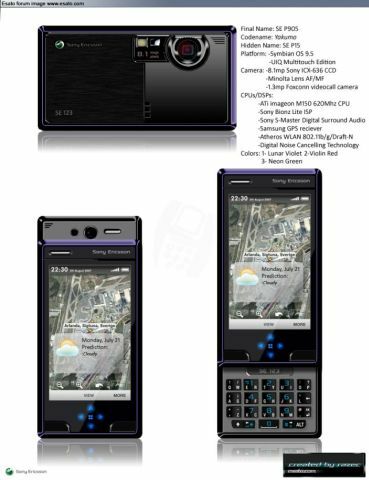 We’re dealing with an UIQ device, bearing the codename Yokumo and using the Symbian OS 9.5 platform/UIQ Multitouch Edition. 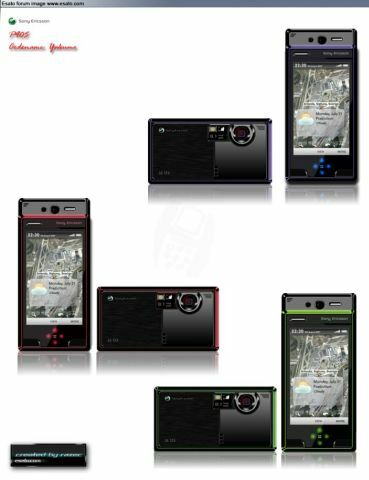 The camera of the P905 is quite impressive, with its 8.1 megapixel sensor (Sony ICX-636 CCD), a Minolta Lens (AF/MF) plus a 1.3 megapixel Foxconn videocall camera. And you haven’t even found out the CPUs/DSPs included in Razec’s latest creation! I’m talking about a powerful ATI Imageon M150 CPU (620 MHz), a Samsung GPS receiver, digital noise cancelling technology, Atheros WLAN 802.11 b/g/Draft-N and Sony S-Master Digital Surround Audio. 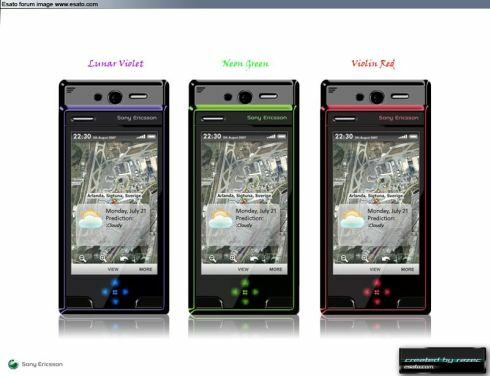 As for the colours of the device, it’ll arrive (in fantasy land) in lunar violet, violin red and neon green (image below).